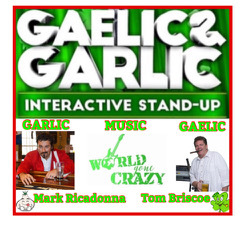 Spice Up Your St. Patrick’s Day Celebration at Bridge Street Live with Gaelic vs. Garlic Comedy Night featuring comedians Tom Briscoe and Mark Riccadonna and music From The World Gone Crazy Duo. Don’t miss this hysterical night of audience interactive routines. Plus, The World Gone Crazy will have you in stitches, singing along to song parodies of the rock ‘n’ roll music that everyone in the room will know & remember. You don’t have to be Irish or Italian to experience a night of comedy that will make us all feel like we all grew up in the same house. Tickets for this live stand-up comedy and music show are $15 for General Admission and $25 for VIP (plus fees).